OLD PARKED CARS. 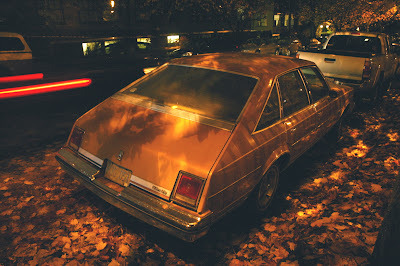 : Rainy, Grainy, Revisited: 1978 Oldsmobile Cutlass Salon Brougham Aeroback Sedan. 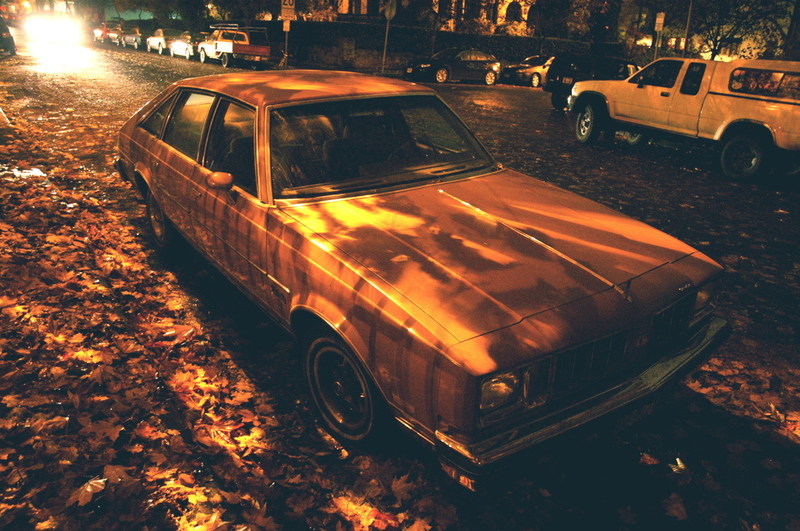 Rainy, Grainy, Revisited: 1978 Oldsmobile Cutlass Salon Brougham Aeroback Sedan. As originally spotted by Ben in May of '11. I crossed paths with the car yesterday and was reminded of these photos, which apparently have been sitting on my hard drive since November of '11. I can't believe that the ground will be covered soggy brown leaves in just two months. I love the last shot, it's full of oranges and browns the lights complete the shot. even though autumn makes me sad because the warmth of summer has gone, that shot is so amazingly beautiful. 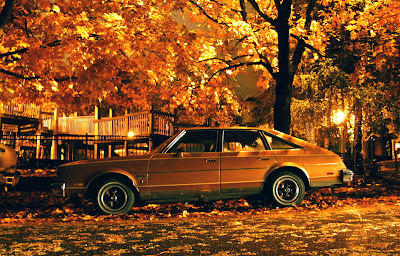 its like an autumn wonderland. Tiburon's right. The bottom photo is art. Good stuff. Good work Tony. If I was an art teacher I'd give you an 'A'. The shades of gold and orange in the last one! Love it. Great pics of a car that seems bizarre by today's standards. It makes me wonder what people will say about today's cars in 30+ years. By the way, what the heck makes it a "Brougham" ?? Absolutely amazing shots, good enough to be considered art. That last photo is utterly fantastic--bravo! @Getafix, Brougham was the top trim level for that model. GM used that one a lot--my family had an '86 Pontiac Parisienne Brougham. Trumpeting my praises as well for the third photo. What a cohesive capture!